Muscle Car Wars Prediction? - Cars! Cars! Cars! Good facts. I'm gonna wait for the next update on this. Wow the car was really hot. I like the body paint a lot and its front body. Hi, I just bought a Mustang last Friday, and traded in my older Mustang. I love V8 engines no matter what gasoline cost. Non-essential? I have to get to work every and I want to "enjoy" driving. In the late 70s after college, having had a 60s muscle car, I bought a low powered Japanese sports car and vowed "never again". I am getting about the same gas mileage and yet more power, so if the car companies can keep doing that, I am laying my cash on the line (which I am literally doing today with the car dealer). My other car is a 4x4 SUV, so I get the cars everyone loves to hate. 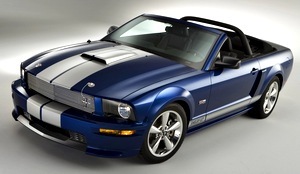 I am addicted to muscle cars and am excited to see the return of the "Muscle Car Wars" in 2009! I think it's going to be exciting regardless of global warming, oil dependency and the price of gas.